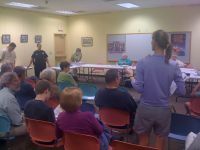 District Representatives Officer Kelly LaHood and Troy Schouest attended the Allandale Neighborhood Association's meeting last night to talk with residents about recent crime in the area and what is being done about it. Allandale is now a "hot spot" meaning the number of burglary of vehicles and burglary of residences in the area has risen to the point to where the Austin Police Department is spending more time patrolling the area. There have been 19 burglary of vehicles and 19 burglary of residences in the last month. Yesterday there was a burglary of residence reported on Carleen Dr. Officer Kelly LaHood explained to the 30-plus residents in attendance there is only so much APD can do in the area and it is important the neighborhood work together and with APD in addressing the problem. She complimented Laura DiCarlo's efforts in organizing the block captain network and in coordinating neighborhood safety efforts in Allandale. In fact, she said, Hyde Park was the only other central city neighborhood that was as active when it comes to neighborhood safety. There does not seem to be a pattern to the burglaries to suggest there is an organized group behind the crimes, but many of the burglaries are during the day when people are at work. Often a back door or window is left open and entry is easy. There was discussion about the homeless and transient population in and around the area which accounts for some of the crimes but certainly not the majority. Officer LaHood said to be on the lookout for suspicious behavior and individuals in the neighborhood and door-to-door scams. It is best to have a no solicitors sign on your door, do not open your door to solicitors, but tell them to go away through the door. If you do not respond they may think you're not home and send someone to your back door to break in. Unfamiliar people walking around on your street with back packs, for example, should catch your attention. Call 911 if someone with a backpack is looking in car windows, etc. It's not uncommon for trucks or vans to be disguised as work vehicles casing the area. She said there are scams where an individual will knock on the door and as you are talking to them, they are looking past you casing your home. She talked about a number of the items below from the crime prevention sheet that Laura put together. The big take-away from the meeting was "harden the target." Make it difficult for someone to break in to your house or your vehicle. Read and follow the tips below. 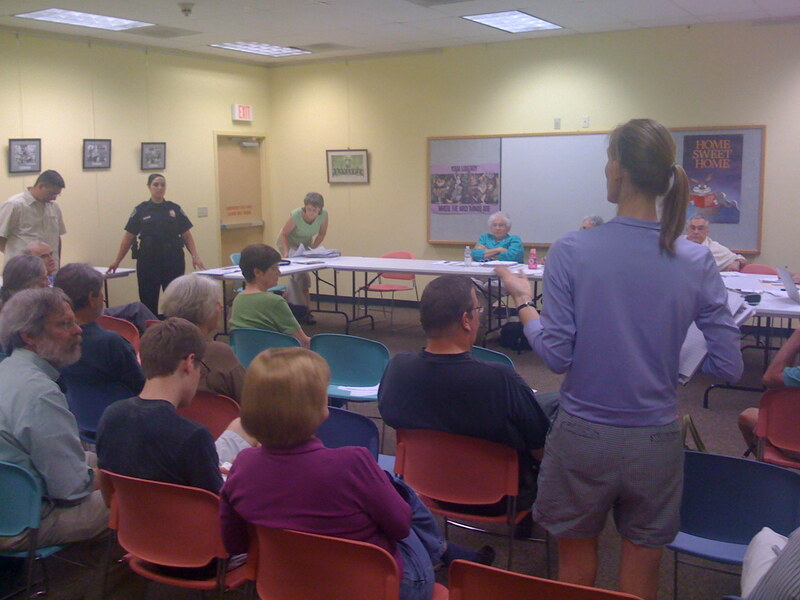 If you want to get involved in Allandale's block captain network, contact Allandale Neighborhood Watch Coordinator Laura DiCarlo at 323-6929 or lhdicarlo [Email address: lhdicarlo #AT# yahoo.com - replace #AT# with @ ]" target="_blank">lhdicarlo [Email address: lhdicarlo #AT# yahoo.com - replace #AT# with @ ]. Get to know your neighbors by name and be able to identify them and their vehicles. Call 911 if you ever suspect someone is in your area who should not be. Reduce high bushes and other foliage around your home in which people can lurk or hide. Give the appearance of someone being home when you are not. Leave lights on a timer and a car parked in the driveway. Have a neighbor check on your house frequently if you are out of town. Tell neighbors when you plan to have workmen coming, so that people posing as workmen will be quickly identified as such. Replace your exterior doors with solid care doors that are 1 3/8 inches thick and secured withdeadbolts. Lock all doors and windows when you are not home. Secure windows with 2 locking devices. Close garage doors or secure valuables in a car port whenever you are not right there. Invite a member of the Allandale Safety Committee to do a safety audit on your property. Record serial numbers of electronics and keep an inventory of all valuables including jewelry, china, electronics, etc. The inventory (pictures, written list, etc.) should be kept in a fire-safe box somewhere away from your home. Engrave property that doesn’t have a serial number. Consider getting an alarm system or even just an alarm system sign, and a dog. Hide all valuables in your home or car. Someone should not be able to look into a window and see your valuables when you are not home. In the evenings when you are watching tv close the curtains so people can not look in and see the television. Store purses and cell phones out of sight. When out of town cancel all deliveries such as the newspaper, and have a neighbor check for handbills on the door. Arrange to have your lawn cared for if you are going to be away. Don’t hide keys under doormatsor flowerpots or in similar places. Let a neighbor (especially your block captain) know how you can be reached in case of emergency. Let only those who need to know when you are going out of town. Report all crimes to the police immediately and post details on the listserve as well. If you arenot on the listserve please consider joining and have your block captain post the incident (no names need be used). The more information we all have the better we can see patterns, prove to APD about the need for more patrols, and in general better deal with crime in our area. If you believe someone has broken into your house, leave immediately and call 911. If you are not already, become an Allandale Neighborhood Association member. The more community involvement and connectedness there is the safer we will all be.